It looks great, plays great and sounds great too - if only it wasn't so expensive! Accurate Zemaitis like style; playability; sound. Not 100 per cent accurate; price. How much? Yep, let's not beat about the bush, AC Zemaitis guitars do not fall into the cheap category - but not only do they capture the style of the late and legendary Tony Zemaitis but, you've got to admit, they do look pretty cool, huh? Looks were a crucial ingredient of the original Zemaitis guitars. They were primarily 'stage' guitars, meant to stand out from the crowd - something that the Metal Front, Pearl Front and Disc Front guitars, Zemaitis' best-known designs, certainly did. A year after Zemaitis passed away in 2002 his wife and son made an agreement with the Japanese corporation Kanda Shokai to ensure the continuation of Zemaitis Guitars. 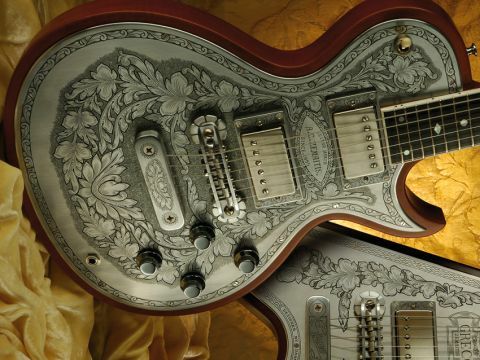 The high-end AC Zemaitis guitars are made in small numbers in a Japanese custom shop; while the Greco versions, licensed from Zemaitis International, are more affordable and made in higher numbers. Zemaitis made his first "half decent" guitar in 1955 (it was a classical) but it was 10 years before he became self-employed, in 1969. It was "around this time," Tony told us in the early nineties, that "electrics were introduced". Zemaitis had learnt the old-school way as an apprentice cabinet-maker prior to making that first guitar. He knew wood and how to work it. But a decade of making acoustics, not to mention being a fledgling player, gave him understanding of acoustic principles in both acoustic and electric guitars. His electric bodies were always three-piece, as here. "It helps to keep the resonance very high and 'wolf' notes down," said Tony. The tops of the Metal Front, Disc Front and inlaid top guitars were always slightly curved (pearl fronts were more carved, Les Paul-style), "so onstage the light dances over it instead of flashing when it's totally flat - like Alf Garnett's glasses!" Here, the body depth is 40mm but, thanks to that slight top curve, the overall thickness is greater at 44mm, including the 1.5mm thick Duralumin (an old name used for a lightweight aluminium alloy widely employed in aircraft building, containing copper, magnesium, and manganese) facing. The neck-to-body joint is simple but very effective. The full width of the neck slots into the body; there's a small lip on the treble side which ends with a distinctive curve at its front. There's no heel, the neck just sits over the square corner of the cutaway single-cut design - a more gaunt-looking Les Paul. There are no contour cuts, but the back of the spiky treble horn is chamfered away, which has little practical advantage, but does match the underside of the tip of the elegant and distinctive 'Z' head, which is again nicely carved away - both are original Zemaitis traits. The three-piece neck design is again typical of Zemaitis: the harder centre section would be quarter-sawn, the two outer pieces diagonally grain-matched. It's hard to see if that matching is followed here but it's clearly a three-piece. In terms of depth the neck is 21mm at the first fret and 23mm at the 12th with quite a classic 'C' oval. There's nice detailing at the edges which, although bound, curve slightly into the fingerboard. The binding and fretting is interesting too and very Zemaitis - the fret slots cut through the binding, which means that not only do the frets sit over the full width of the board but, should there be any shrinking of the fingerboard, which can push the binding away from the fingerboard, the frets merely slightly protrude and can easily be filed - like an unbound fingerboard. Fret work is very tidy, the fret ends are beautifully rounded and the simple inlays - including Zemaitis' unofficial trade mark diamond cluster around the 12th fret - cleanly inlaid; the job is topped off with what looks like a bone nut, very nicely cut, rounded and polished. A simple bound ebony-faced head bears the diamond-shaped, 'Z' engraved plate and long truss rod cover. But unlike an original Zemaitis the truss rod adjustment nut is directly behind the nut; Zemaitis sited it further into the headstock, hence the longer truss rod cover. Correctly copied here is a slight bump - extra thickness - that starts under the nut and runs between the two outerstring tuners. "I find it ludicrous to see the rod adjustment right behind the nut - the thinnest point of the neck - that's another reason why I place it further down the headstock," said Tony. Tony never spray-finished guitars, preferring to hand-apply his finish, "an acid catalysed lacquer" although the precise recipe remained a secret. Here the finish is cellulose, again apparently hand-applied and polished to a faultless satin sheen. It's almost too perfect actually - Zemaitis' originals were rougher, reflecting their extensive handwork and hand finishing. The metal front, headstock logo, truss rod cover, pickup rings, bridge, string anchor, rear toggle switch and control covers are all Duralumin, fabricated in the UK. And although Zemaitis' original engraver Danny O'Brien has his name engraved at the base of the detailed front design, he only supplied the original designs - they're replicated by hand in Japan. The Zemaitis bridge is a flamboyant affair. Originally hand-made by Tony, the all- Duralumin tune-o-matic-style bridge is centered around a 'U'-shaped extrusion with six individual saddles, adjustable from the pickup side with cross-head screws; the other ends have welded nuts. Two threaded, domed and slot-head bolts screw into the body and the thumbwheels are large discs, 32mm in diameter with eight 'petals'. The string anchor is just a block of Duralumin bolted to the body, but the strings holes are curved to match the radius of the bridge's saddles. In some ways the hardware, while visually striking, is quite crude, but it's effective and the material adds to the guitar's lively resonance. For a guitar at this price, you'd expect the pickups to be wound on the thighs of a dusky maiden. Instead they're off-the-shelf DiMarzio PAFs - introduced back in the seventies, so at least they are period correct. Control hookup is Les Paul-like: the CTS pots married with large SBE/Sprague 'orange drop' polyester .05 microfarad capacitors. Of course, as originally intended, the metal front, which is electrically conductive, acts as a shield to prevent noise. There's also an inset spring under the rear cavity, presumably to stop any rattles or vibration if the plate isn't seated properly. There's also a serial number engraved onto a small clear plastic bar affixed to the inside of the very neat control cavity. Despite its price, the guitar isn't part of any limited edition and neither is it an exact replica of a famous artist's guitar. Case candy is limited to a small certificate and a leather pouch containing four standard screwdrivers with the Zemaitis monicker on them, a truss rod wrench and a polishing cloth. At this price we'd have at least expected the recipe for Tony's wife Ann's fabled pizzas! So what does £7,000 of guitar sound like? Thankfully, good: very good. The lively acoustic ring translates to a resonant-sounding classic rock-voiced guitar with a fast response, tight but not lacking lows, clean, zingy highs and a throaty mid-range. The controls work well, the volume darkening the sound and cleaning up the gain when reduced, the tone control tailoring the highs until, fully off, that softer tubey tone emerges. The Les Paul-alike control layout means there are plenty of subtle mixes to be had too. Of course, with a Faces-like medium crunch it's a perfect guitar, yet its lively response means it'll handle most rock styles and certainly, with outputs on the higher side of PAF, it doesn't overly mush up at volume. In fact there's a clarity and purity to the sound that, along with that particular mid-range voice, gives it its own character - a little more pushy than classic SG perhaps, less wide than a good Les Paul. And we couldn't resist tuning to open E and whacking out a few Faces riffs. If that's your bag, this is the guitar. It's very nicely set-up too, although the 25-inch scale could easily take heavier strings without feeling too tough. Playability is easy, no issues there at all. With original Zemaitis Metal Fronts valued at $30k upwards, these guitars - the closest you can buy to the real thing - don't seem over-priced. But what are we saying? As good as they are neither warrants its price tag - aside from the engraving, they're not difficult to produce and although 'Honduran' (aka South American) mahogany is hard to procure at the right weight and is rapidly getting more expensive, it still doesn't go near justifying this cost. So what if the AC Zemaitis is made in a small custom shop somewhere in Japan? Yes, it's a very finely made piece - to be honest, in that regard it's superior to an original - but it remains just a replica at a third or quarter of the price of an original; there's little case candy, they're not limited in any way or replicas of specific 'historic' originals. But value is very much in the eye of the beholder. If you want a Zemaitis, these guitars and the others in the dual ranges, are the only way to get one - the closest most of us will ever get to the real thing.